OUR TRANSFER SERVICES - sms-flughafentransfers Webseite! No matter if you prefer the luxury of a private transfer with personal driver or the affordability of a shared airport shuttle, you can always rely on us. Our friendly and professional drivers will make sure they deliver you to the right terminal at the airport or to any other destination. If you have booked a private transfer our driver picks you up wherever you want and brings you straight to your destination without other passengers (except if there are further people travelling with you), stops or additional waiting times. You can sit back and relax. We make your journey stress-free and as relaxing as possible. This type of service offers an economical solution that transports different passengers travelling to the same airport or on a similar route. At present we only offer collective transfers to Munich and Vienna airport. We pick you up at your front door, so you don't have to worry about anything. Travel time is increased to allow collection and drop-off of different passengers. On your way back from the airport to your home destination we try to avoid waiting times longer than 60 minutes after your registration at our transfer counter. We ask for your understanding if in a few cases, a longer waiting period is required due to the late arrival of other passengers. Even if your flight is delayed we give you the guarantee that we will bring you back home! Whenever you need a reliable partner for any kind of transportation we we are the right contact for you and we find the ideal solution. Our comfortable minivans have seating for up to 8 passengers. Please contact us. We are going to process your demand as soon as possible and send you our best offer matched to your requirements. At Munich airport the meeting point with your driver is in the central area in terminal 1 at the "SMS Airport Transfer" counter. It is easy to find. In case you should have any difficulty please ask at the airport information desk. They will indicate you the way. In Salzburg, Linz, Graz, Klagenfurt and Innsbruck your driver is waiting for you in the area after the security checkpoints, holding a panel with your name written on it. If you have booked a collective transfer we pick you up from your front door in a minibus with a maximum of 7 other passengers (if it is permitted regarding the traffic rules) and take you to your destination. On your return we try to avoid waiting times longer than 60 minutes after your registration at our transfer counter at the airport. Sometimes it might happen that you and your driver don't find each other, or that your driver on his way to the airport is coming late for a few minutes. In those rare cases, please do not leave the airport building, but wait at the information counter in the arrival hall. 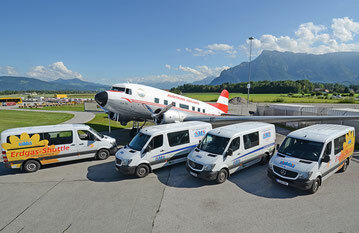 For emergencies please call our service team in Salzburg dialing the following number: +43 (0) 662 8161-0. We are available for you 24 hours a day and we will be pleased to assist you with any kind of questions and problems.